P25 On the face of it BRM turned to simplicity for the 2.5-litre formula car with the handsomely proportionea little P25. This had a 2491cc (102.87 x 74.93mm) four-cylinder engine designed by Stuart Tresilian. The car showed speed but had tricky handling, and there were persistent problems with valves, the single rear transmission brake and with putting the whole project together. Issigonis advised, Moulton advised, Chapman reworked the de Dion rear suspension and replaced the oleo struts with conventional coil springs and dampers, Rudd revised the front suspension and for 1959 Berthon reworked the engine to accommodate AvGas as it became obligatory. The products of all that effort were victories in secondary races, and JO Bonnier's victory in the Dutch GP. Soon there was pressure from within the team for a rear-engined replacement, but third place in the 1959 Constructors' Championship was an achievement for the Bourne team. Drivers: Jean Behra, Tony Brooks, JO Bonnier, Peter Collins, Jack Fairman, Ron Flockhart, Mackay Fraser, Mike Hawthorn, Hans Herrmann, Les Leston, Stirling Moss, Roy Salvadori, Harry Schell, Maurice Trintignant. Peter Collins in the compact P25 at the car's debut meeting, at Aintree in September 1955. The lines of this BRM changed linle through its long career. 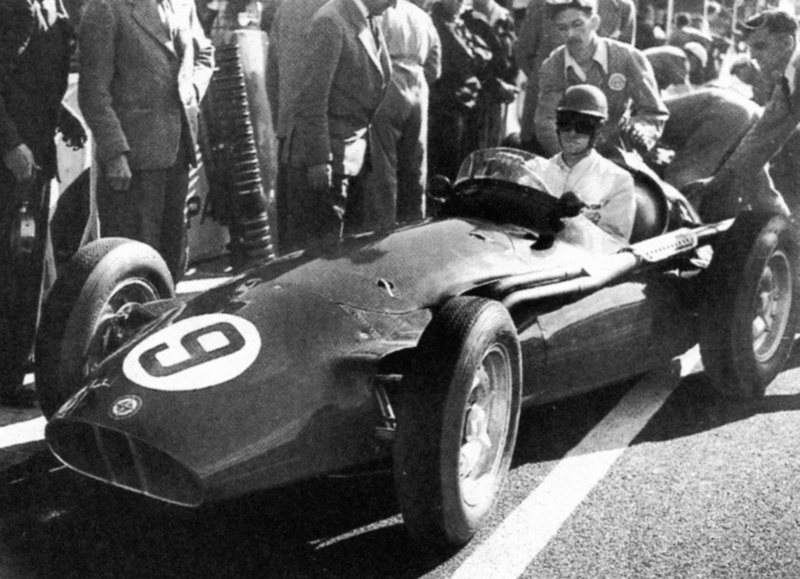 Here near its end, Harry Schell in a works car on his way to seventh place in the 1959 French GP passes the pale green car that had been loaned to BRP and was driven in this race by Moss, resting from his futile efforts to push restart it in the Reims heat.